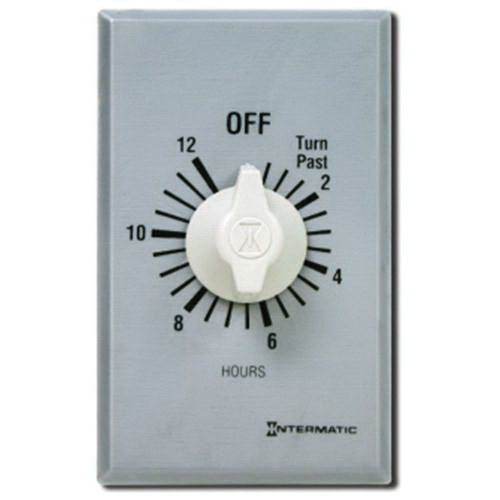 Intermatic 2-Pole Commercial mechanical spring wound countdown timer with 12-hour timing, has voltage rating of 125 - 277-Volt AC at 50/60-Hz. It has a dimension of 1.75-Inch x 1.25-Inch x 4.125-Inch. This timer with auto ON action, has current rating of 10-Amps at 250/277-Volt AC, 20-Amps at 125-Volt AC for resistive load and 7-Amps at 125-Volt AC for incandescent load. It features a silver colored aluminum plate with brushed metal finish, a white plastic knob and has a temperature rating of 0 to 40 deg C. This ivory colored timer with DPST contact configuration, has contact rating of 10-Amps at 250/277-Volt AC, 20-Amps at 125-Volt AC for resistive load, 1 hp at 125-Volt AC and 2 hp at 250-Volt AC. It provides timesaving up front terminal connection with teeter-type terminals. This timer is great for bathroom fans, spas, hot tubs, storage closets and garage lights. Countdown timer is cCSAus certified and cULus listed.